The EBC invited singers and choral directors to join them for a day of musical discovery, with the first opportunity to sing a remarkable new choral work by John McCabe. In 2013 EBC commissioned and gave the world premiere of McCabe’s Psalm-Cantata. Scored for soprano and baritone soloists, SATB choir, and with either orchestral or organ accompaniment, this work takes us through high drama – ‘hailstones and coals of fire’ – to serenity in ‘The Lord is my Shepherd’. The conclusion is a powerful call for the unity of mankind. Jeremy Jackman, former King’s Singer, directed the day, saying ‘The work is full of vibrant textures and colourful portrayal of text, and it is an important addition to choral repertoire. McCabe’s piece has the great advantages of being 1) a terrific addition to contemporary repertoire 2) approachable 3) affordable’. 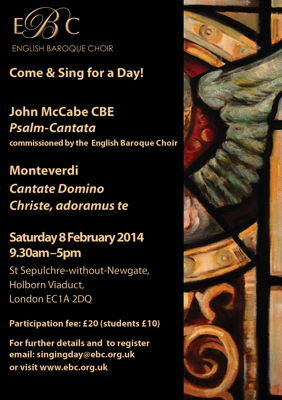 Participants also worked on Monteverdi’s Cantate Domino and Christe, adoramus te. The event was not only well-attended, but demonstrated the laudable skills of choral singing in this country, as well as the outstanding choral direction and encouraging leadership of the conductor.